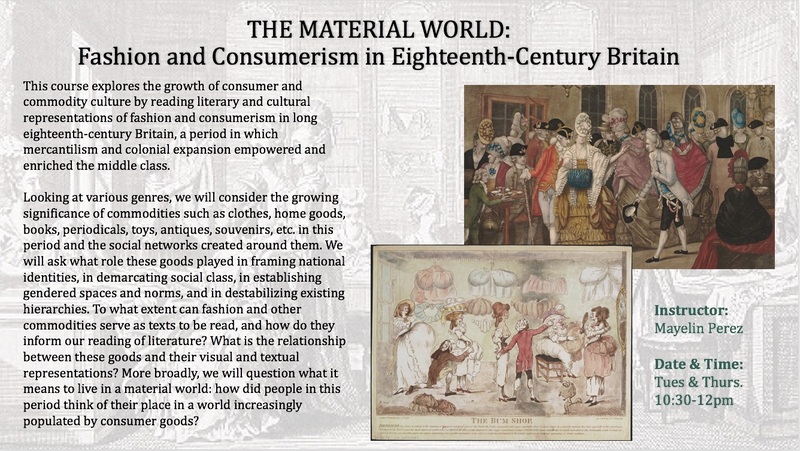 This course explores the growth of consumer and commodity culture by reading literary and cultural representations of fashion and consumerism in long eighteenth-century Britain, a period in which mercantilism and colonial expansion empowered and enriched the middle class. Looking at various genres, we will consider the growing significance of commodities such as clothes, home goods, books, periodicals, toys, antiques, souvenirs, etc. in this period and the social networks created around them. We will ask what role these goods played in framing national identities, in demarcating social class, in establishing gendered spaces and norms, and in destabilizing existing hierarchies. To what extent can fashion and other commodities serve as texts to be read, and how do they inform our reading of literature? What is the relationship between these goods and their visual and textual representations? More broadly, we will question what it means to live in a material world: how did people in this period think of their place in a world increasingly populated by consumer goods? This course will likely include works by Eliza Haywood, Samuel Richardson, Tobias Smollett, Richard Brinsley Sheridan,and Fanny Burney, alongside Bernard Mandeville’s The Fable of the Bees, Addison and Steele’s Tatler and Spectator periodicals, Henry Fielding’s Convent-Garden papers, and writings by Adam Smith. We will also explore consumer culture more broadly by examining visual objects such as fashion dolls and catalogues, consumer spaces such as public showrooms and domestic interiors, as well as the book trade and the culture of manners.